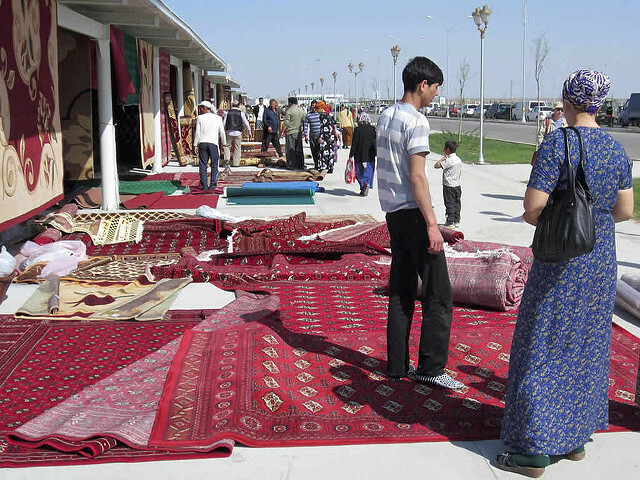 As the serious economic crisis continues in Turkmenistan, authorities have gone to great length to cover up its impact by rigidly controlling state media, preventing citizens from accessing foreign sources of information and intimidating those who comment or speak out against the socio-economic problems in the country, whether by liking social media posts on such issues, writing complaints or otherwise raising their voices. At the same time, the authorities continue to forcibly mobilise citizens for regime-praising events and arbitrarily bar dissenting individuals from travelling abroad. The president’s personality cult is systematically promoted and his family members also enjoy extensive privileges. This update covers developments relating to the protection of freedom of expression, association and assembly in Turkmenistan from June to September 2018. International Partnership for Human Rights (IPHR) and Turkmen Initiative for Human Rights (TIHR) have prepared the report for the CIVICUS Monitor based on TIHR’s monitoring of the situation in the Central Asian country. As covered in previous updates, all media outlets in Turkmenistan are strictly state-controlled and used as means of state propaganda. The current economic crisis has seriously affected the population, among others, because of dramatically increasing prices on consumer goods, the scarcity of basic food products, rationing and long lines outside state-owned food stores, where prices are still state regulated. However, state media ignores these problems and reports about “full” store shelves and the “abundance” of food products in the country. As part of the state propaganda aimed at covering up the impact of the crisis, fake counters featuring chicken packages stuffed with cotton have also appeared at food markets in Ashgabat, as documented by TIHR monitors. The authorities continue to arbitrarily remove privately-owned satellite dishes, thereby preventing residents from accessing foreign TV and radio channels that provide alternative information about the situation in the country. The campaign against satellites dishes is not limited to the capital and other large cities but is also carried out in rural parts of the country. Recently the authorities have used intimidation tactics in addition to physically removing satellite dishes. For example, in June 2018, local authorities in the Dashoguz region held a meeting with the heads of state institutions, demanding that they ensure that the employees of these institutions do not watch foreign TV channels, get rid of satellite dishes they currently own and refrain from installing new ones. As previously reported, many websites featuring information that challenges state propaganda, as well as social media sites are blocked in Turkmenistan. At the same time, the authorities have attempted to restrict the use of so-called proxy servers that are used to circumvent internet censorship, and individuals who visit independent news sites and social media sites have been subjected to intimidation. For example, in June 2018, the Turkmen service of Radio Free Europe/Radio Liberty (RFE/RL) reported that police in the city of Turkmenabad summoned a local resident and threatened him with imprisonment for visiting the RFE/RL page on social network Odnoklassniki and “liking” posts there. Recently there have also been several cases of residents facing pressure after publicly drawing attention to corruption, which is a problem the current crisis has further reinforced. Ashgabat-based history teacher Batyr Batyrov told TIHR that local police threatened him and his family with repercussions if he continues to submit complaints about corruption to the authorities. Batyrov has repeatedly made complaints about corruption within the education system. In another case, pensioner Khekim Khadjiev from the city of Balkanabad was intimidated after publishing complaints about corruption in the country on independent websites. Alternative Turkmenistan News (ATN) reported that police held him under surveillance and summoned, questioned and threatened him, demanding that he “confesses” to “cooperating with opposition sites”. His internet and mobile phone connections were also blocked. The authorities continue to arbitrarily restrict travel of citizens, in particular, critical voices and their family members. According to information from Turkmenistan’s Independent Lawyers Association, a Netherlands-based exiled NGO with which TIHR cooperates, the number of citizens blacklisted for travel abroad currently exceeds 30,800 persons. The security services, the Interior Ministry, the Prosecutor-General’s Office and the State Migration Office may all decide to blacklist individuals. Security concerns are often used to justify travel bans, but there are no transparent criteria for prohibiting citizens from travelling abroad. Omursak Omarkuliev, a student enrolled at a university in Turkey who had founded an association for Turkmen students in this country, was barred from returning to Turkey after visiting Turkmenistan earlier this year. Omarkuliev told the Turkmen service of RFE/RL that he was repeatedly barred from boarding planes to Turkey at Ashgabat airport in February-March 2018 and that his appeals to different authorities went unanswered. In mid-June 2018, the RFE/RL service reported that authorities detained Omarkuliev and he was held at the notorious Ovan Depe prison, believed to have been sentenced to a lengthy prison term. TIHR’s sources confirmed this information, but it is not known what the charges against the student are. Several people remain imprisoned on politically motivated grounds in Turkmenistan. These include people who have been charged because of their peaceful exercise of the freedoms of expression, association and religion. According to the Russian NGO Memorial, in late June 2018, more than 30 relatives of individuals imprisoned on charges of “religious extremism”, believed to be politically motivated, were allowed to visit these prisoners at the notorious Ovan Depe prison for the first time since the prisoners were convicted. The visits were limited to about 40 minutes. It appeared that the authorities agreed to the meetings as a result of international pressure. However, the relatives of other categories of political prisoners were not granted similar visits. As covered previously, many individuals considered political prisoners have disappeared within Turkmenistan’s prison system, with their relatives not having received any information about the fate and well-being of these prisoners for years. An updated list of disappeared individuals that the Prove They Are Alive NGO campaign published in September 2018 features 121 names. The authorities continue to forcibly mobilise residents for state-organised mass events, in violation of the freedom of assembly, a fundamental aspect of which is the right to voluntary participate in assemblies. In particular, employees of state institutions are often forced to take part in various state-organised events, as well as the time-consuming rehearsals for these events. The authorities forced employees at state institutions and students to participate in festivities organised on Independence Day, which is now celebrated on 27th September. The rehearsal for the festivities, held outside the presidential palace in Ashgabat, started a month in advance. Hour-long rehearsals took place outside in the capital’s hot summer weather. The authorities mass mobilised state employees for festivities on the Day of Revival, Unity and Poetry of Makhtumkuli Fragi, a national poet. This day is celebrated on 27th June. Teachers who were on vacation at this time also had to participate in the festivities held in the capital and the rehearsals thereof. A teacher interviewed by the Turkmen service of RFE/RL said that she and her colleagues had to get up at four o’clock every morning and walk 25 kilometers by foot to Ashgabat for the lengthy rehearsals. In addition to forcing state employees to participate in mass events, the authorities also force such employees to carry out free labour, such as picking cotton and cleaning streets. Citizen-initiated assemblies are rare in Turkmenistan, but occasionally spontaneous protests on issues affecting their everyday lives occur. In the context of the current economic crisis, there have been examples of such protests. According to reports from foreign-based news sources, local residents protested against the drastic increase in the price of chicken legs at an outdoor market in Ashgabat in early July 2018. In addition to expressing discontent about the price increase, the protesters also voiced concerns about high unemployment rates and poverty in the country and some of them loudly accused the president of being responsible for the current situation. According to the same media reports, some of the protesters did not remain peaceful and attempted to destroy sales stands. Plain-clothes police officers soon arrived and detained some of the protesters, while others ran away. Police reportedly beat many of those detained. However, TIHR does not have further information about the allegations of ill-treatment or the fate of those who were detained.